I recently acquired a good run of Argosy in the 1930s, and plan to work through them over time. I'll post my notes here as I work through individual issues. I only plan to post reviews of serials that begin in the issue. It's difficult to review a serial instalment on its own, and most of the time you only need to decide if the serial is worth reading or not, so I'll review the complete serial in the issue it begins in. If you have read this issue, let me know what you think. 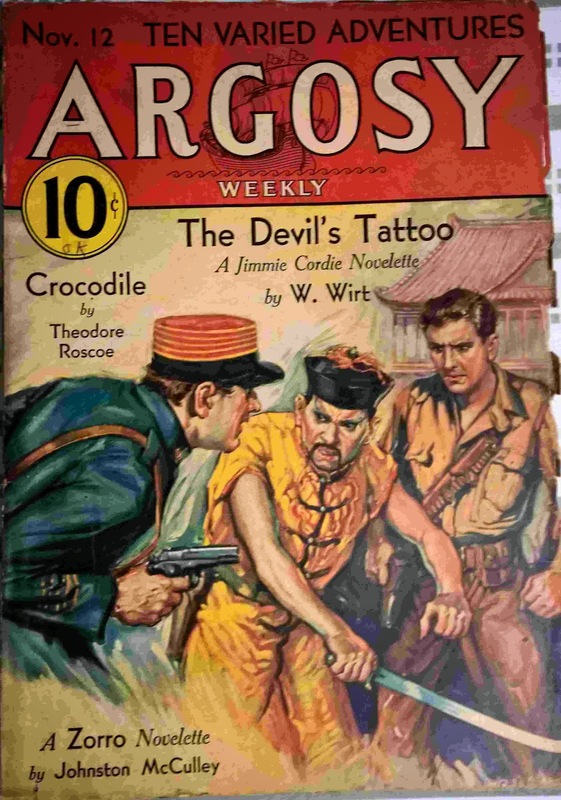 A Jimmy Cordie novelette where Cordie and his mercenary band aid a Manchu noble to defend a city against a Chinese warlord. Nothing out of the ordinary. I usually like Theodore Roscoe, but felt this dragged on too long. It’s supposed to be a mystery, but I think the conclusion is obvious from the beginning. The prize of this issue. Written 25 years before the Disney TV series, it reads like a script for an episode of the serial. I could almost see the scenes and hear the music in my head. Well done swashbuckling adventure. Carbon monoxide poisoning in an igloo is an interesting experience. A good story of a beat cop who uses his brains and his guts to good effect against a gang. A surprisingly good story of a South Seas trader using his wits to send off a brutish supervisor without damaging “the prestige of the white man”. The concept is racist but the hero of the story is a man who believes in treating his native workers well. The author of this story later on went to write the story that was made into the movie "Lilies of the Field". I have this issue but I've yet to read it. While looking through the pages I made the horrifying discovery that a Breaker had excerpted pages. Pages 117 through 144 are missing in order cut out the Merritt serial installment, BURN, WITCH, BURN! Breakers used to be more common in the old days before pulp reprints and several collectors thought nothing of excerpting and cutting out pages in order to make little homemade books. This issue is otherwise in great shape and looks to be in fine condition until you notice the missing pages. Every Breaker I ever talked to swore that they only broke up no cover or fair to poor condition magazines. Complete nonsense of course because once you get into the habit of cutting out pages, it becomes like a disease or an addiction. They feel compelled to destroy and make their own homemade books, in this case the serial parts were stapled together in order to have the complete Merritt novel together. I only know of one Breaker still active among pulp collectors and he is still at it. I've told him we live in the Golden Age of Pulp Reprints and there is no need to keep destroying magazines. By the way, it is almost impossible to buy slick magazines without worrying about pages being missing. Breakers often cut out the full page ads and frame them. I still see their tables at flea markets. As you can tell this is a subject that really annoys me because I've been victimized so many times. Now I have to find another copy of the November 12, 1932 issue. One that has all the pages. By the way, the cover is by Robert A. Graef. I too hate finding copies with pages cut out/missing. However...the Harold Lamb collections put out by Bison Books apparently used such compiled volumes as a source. So not all bad...and you will probably be able to get the missing issues at Pulpfest, right?